Starting and finishing at a brand-new, dog-friendly location – Weston Cricket Club! 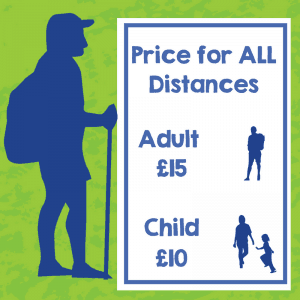 Registrations open at 6am for 30 mile walkers, 8am for 20 mile walkers and 11am for 10 mile walkers, with Bakers Dolphin coaches taking participants to their starting location. So…what are you waiting for? Please be sure to choose a distance you can realistically achieve on the day as participants must check-in at the finish line before 8pm. It costs £4.2million every year to run the hospice, by taking part and raising money you will be making a HUGE difference! *Suggested minimum age for 30 miles: 14 and over with previous walking experience. Registrations close at midnight on Sunday 26th May. For more information call 01934 423960.